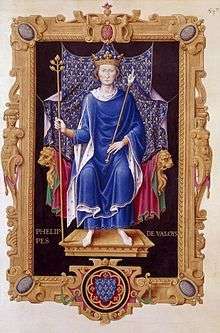 Philip VI (French: Philippe VI) (1293 – 22 August 1350), called the Fortunate (French: le Fortuné) and of Valois, was the first King of France from the House of Valois. He reigned from 1328 until his death. In 1349, Philip VI bought the Dauphiné from its ruined ruler Humbert II and entrusted the government of this province to his grandson Charles. Philip VI died in 1350 and was succeeded by his son John II the Good. Little is recorded about Philip's childhood and youth, in large part because he was not of royal birth. Philip's father Charles, Count of Valois, the younger brother of King Philip IV of France, had striven throughout his life to gain a throne for himself but was never successful. 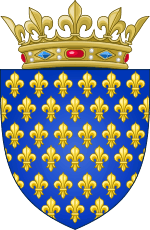 He died in 1325, leaving his eldest son Philip as heir to the counties of Anjou, Maine, and Valois. In 1328, Philip's first cousin Charles IV died without a son and with his widow Jeanne d'Évreux pregnant. Philip was one of the two chief claimants to the throne. The other was King Edward III of England, who was the son of Charles's sister Isabella and his closest male relative. The question arose whether Isabella should have been able to transmit a claim that she herself did not possess. 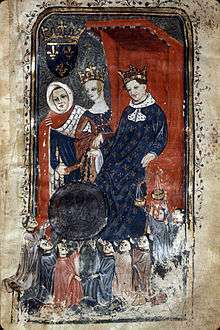 The assemblies of the French barons and prelates and the University of Paris decided that males who derive their right to inheritance through their mother should be excluded according to Salic Law. As Philip was the eldest grandson of Philip III of France through the male line, he became king instead of Edward, who was a matrilineal grandson of Philip IV of France and great-grandson of Philip III. During the period in which Charles IV's widow was waiting to deliver her child, Philip rose to the regency with support of the French magnates, following the pattern set up by Philip V's succession over his niece Joan II of Navarre. 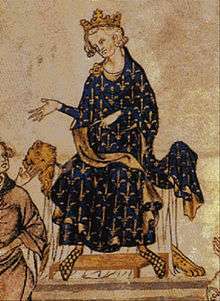 After Jeanne d'Évreux gave birth to a girl, named Blanche, Philip was crowned as king at the Cathedral in Reims on 29 May 1328. After his elevation to the throne, Philip sent the Abbot of Fécamp, Pierre Roger, to summon Edward III of England to pay homage for the duchy of Aquitaine. After a subsequent second summons from Philip, Edward arrived at the Cathedral of Amiens on 6 June 1329 and worded his vows in such a way to cause more disputes in later years. Philip's reign was plagued with crises, although it began with a military success in Flanders at the Battle of Cassel (August 1328), where Philip's forces re-seated Louis I, Count of Flanders, who had been unseated by a popular revolution. His wife, the able Joan the Lame, gave the first of many demonstrations of her competence as regent in his absence. Philip successfully prevented an arrangement between the Avignon papacy and Holy Roman Emperor Louis IV, although in July 1337 Louis concluded an alliance with Edward III. 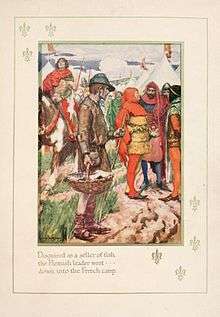 The final breach with England came when Edward offered refuge to Robert III of Artois, formerly one of Philip's trusted advisers, after Robert committed forgery to try to obtain an inheritance. As relations between Philip and Edward worsened, Robert's standing in England strengthened. On 26 December 1336, Philip officially demanded the extradition of Robert to France. Philip declared that Edward had forfeited Aquitaine for disobedience and for sheltering the "king's mortal enemy", Robert of Artois, on 24 May 1337. Thus began the Hundred Years' War, complicated by Edward's renewed claim to the throne of France in retaliation for the forfeiture of Aquitaine. ↑ David Nicolle, Crécy 1346: Triumph of the Longbow, (Osprey, 2000), 12. 1 2 Elizabeth Hallam and Judith Everard, Capetian France 987-1328, 2nd edition, (Pearson Education Limited, 2001), 366. 1 2 3 4 5 Jonathan Sumption, The Hundred Years War:Trial by Battle, Vol. I, (Faber & Faber, 1990), 106-107. 1 2 Jonathan Sumption, The Hundred Years War:Trial by Battle, 109-110. ↑ Kelly DeVries, Infantry Warfare in the Early Fourteenth Century, (The Boydell Press, 1996), 102. ↑ Jonathan Sumption, The Hundred Years War:Trial by Battle, 135. ↑ The Hundred Years War:Not One But Many, Kelly DeVries, 'The Hundred Years War (part II): Different Vistas, ed. L. J. Andrew Villalon, Donald J. Kagay, (Brill, 2008), 15. 1 2 3 Jonathan Sumption, The Hundred Years War:Trial by Battle, 171-172. ↑ Jonathan Sumption, The Hundred Years War:Trial by Battle, 184. ↑ Oars, Sails and Guns:The English and War at Sea, c.1200-1500, Ian Friel, War at Sea in the Middle Ages and the Renaissance, ed. John B. Hattendorf, Richard W. Unger, (The Boydell Press, 2003), 79. 1 2 Jonathan Sumption, The Hundred Years War:Trial by Battle, 320-328. 1 2 3 Jonathan Sumption, The Hundred Years War:Trial by Battle, 354-359. ↑ Mortimer, Ian (2008). The Perfect King The Life of Edward III, Father of the English Nation. Vintage. p. 276. ↑ The kingdom of Burgundy, the lands of the house of Savoy and adjacent territories, Eugene Cox, The New Cambridge Medieval History: Volume 5, c.1198-c.1300, ed. David Abulafia, Rosamond McKitterick, (Cambridge University Press, 1999), 371. ↑ David d'Avray, Papacy, Monarchy and Marriage 860–1600, (Cambridge University Press, 2015), 292. 1 2 Marguerite Keane, Material Culture and Queenship in 14th-century France, (Brill, 2016), 17.